In plain view on a busy street in Covent Garden, The Cross Keys sits behind an impressive, lush mound of green that grows out of it’s exterior, and marble columns supporting beautifully detailed arches with little cherubs atop, holding the keys of Saint Peter. Popular with residents of the area for its chilled and friendly atmosphere, the pub is easily one of the most beautiful establishments in town, with an inside that begs just as much intrigue as its outside. The pub was apparently built as a philanthropic measure, to help clear the slums along the street and nearby. Of all the trinkets to be found inside the place (and there are many), which was apparently built around 1848-49, perhaps the most interesting is a gold bust of the late John Lennon (you can find a picture here: crosskeys). The bust holds a proud and special place on the bar-top, though the story of it’s journey to The Cross Keys is unknown. 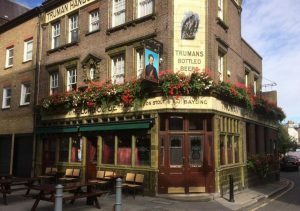 Some say it was a gift from Lennon himself, who was so fond of the pub’s exterior, he gave them the bust to place upon the bar so that the foliage that adorns the pub’s face and flanks it’s doors would never be out of his sight. This is, of course, nothing more than legend – a nice story conjured up by the locals. It is probably more realistic to assume that one of the owners is a big Beatles fan; something that is not hard to imagine, given the band’s historic influence on British culture, the many years that the pub has been there, and the mountain of other Beatles memorabilia on show. There is also a napkin available to view which is rumoured to have been signed by Elvis Presley, as well as a ton of other bric-a-brac, like musical instruments hanging from the ceiling. If your taste is quaint and kooky, give The Cross Keys a visit.